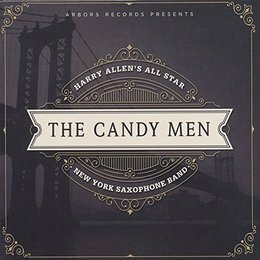 It doesn’t seem that Harry Allen was the new face on the scene playing in an older style in the footsteps of Scott Hamilton but many albums later he has one of the voices in jazz to be reckoned with, he always manages to come up with new ideas and settings to demonstrate his undoubted talents. This is not the first time the idea of an all saxophone front line group has been used there have been forerunners like Supersax, Prez Conference and Bud Shank and the Sax Section but this group is welcome addition. It all started of course with the Woody Herman Second Herd when he employed four tenor saxophones and a baritone in the front line and the rest is history. It is appropriate that the first track on the album is “Four Brothers” arranged by Al Cohn as this is where it all started. All the other arrangements are by Harry Allen and the first up is “The One For You” which was composed by Harry Allen and pianist Judy Carmichael a lightly swinging number which shows off the section in all it’s glory, there is a storming baritone solo by Gary Smulyan as well as all the tenors plus for good measure an incise piano solo by Rossano Sportiello. Another Harry Allen and Judy Carmichael composition Is a bossa ballad “I Can See For Ever” not to be confused with “On A Clear Day” and is a feature for Eric Alexander on tenor and he plays this with great feeling. The Rodgers and Hart ballad is beautifully harmonised by the section led with great skill by Grant Stewart and has some striking piano backing by pianist Rossano Sportiello. Harry Allen’s “So There” must be a torturous piece to play by the saxophone section but they never miss a beat. The album closes with a lightly swing “The Party’s Over” it is a fitting piece to pay for a closer and makes you want to start the album from the first track again. You may think it has all been done before but there is an extra edge to this group that sets them apart from other similar groups, it is a most enjoyable album and let’s hope there may be another to come.